It is very likely that on 1 August 2017 around 2:20 CET, the bitcoin network will be divided into two separate currencies. 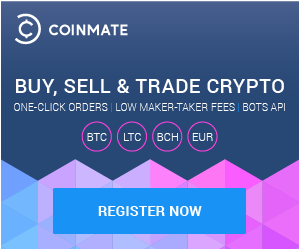 CoinMate will continue to support the current bitcoin, the bitcoin with the highest overall support across the community. Any second, “hardforked” branch i.e. so called Bitcoincash will not be supported at this time. If you also want to deal with bitcoins in the other, “hardforked” network, you will need to withdraw bitcoins from our exchange into a bitcoin wallet that will allow you to transact bitcoins on both networks, or into a wallet that you hold private keys to. In such case make the withdrawal as soon as possible so that the payment can be confirmed in the new wallet no later than 1 August 2017. At the same time, the BIP91 proposal has been activated. Under this agreement miners now reject blocks that do not signal Segwit. Due to the precautionary principle and the protection of our users, we will require 6 bitcoin confirmations for bitcoin deposits starting 28 July, 2017. To ensure safety of bitcoin balance in your CoinMate account, we will disable bitcoin deposits and bitcoin withdrawals starting 1 August 2017 10am CET. We plan to resume bitcoin deposits and bitcoin withdrawals in the morning of 2 August 2017, if it is safe to do so. Trading will not be affected and will remain active throughout the whole time.